The Standard Model predicts that the Higgs boson is unstable and falls apart (decays) only 10-22 s (0.0000000000000000000001 seconds) after it is created. Theoretically, it can decay to a quark-anti quark pair (except for top, anti-top), a lepton anti-lepton pair or to two bosons (like photons or gluons). However, there is also the possibility that it could decay to new particles that have not been observed until now, so-called long-lived scalar particles (scalar means they are spinless just like the Higgs boson). Some theories beyond the Standard Model (e.g. http://arxiv.org/abs/1312.4992) predict that these particles would be unique in that only the Higgs boson would decay to them, meaning it would have been impossible to study them until now – these are one example of what we call ‘exotic particles‘. The diagram above shows a Higgs boson decaying into two exotic particles, which then themselves decay into many more particles – this is how an off-centre vertex could be produced. 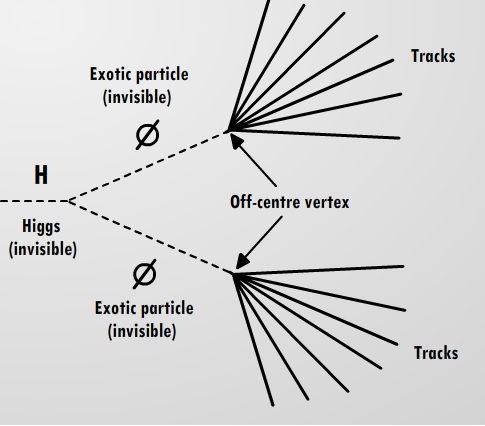 In fact, looking for off-centre vertices was proposed way back in 2006 as a way of detecting the Higgs boson, before it had been discovered (http://arxiv.org/abs/hep-ph/0605193)! Since this process is not predicted by the Standard Model, if we see these in our detector then we will finally be able to realise the dream of obtaining direct evidence for a new theory of nature – opening our eyes to an entirely new realm of physics. If these exotic decays are real, then they have already happened at the LHC and are sitting in the data we have right now, just waiting to be found by a keen pair of eyes. By helping with this project, you can take us one step closer to a deeper understanding of reality – to answering some of the greatest unsolved mysteries in the universe. On July 4th 2012, the ATLAS and CMS collaborations at the Large Hadron Collider (LHC) at CERN, Geneva, independently announced the discovery of a new particle with a mass over 130 times greater than a proton. This was in the range that had been predicted for the elusive Higgs boson, and it had been verified to extremely high certainty. But what do we mean by ‘high certainty’? In Particle Physics everyone agrees on how sure you need to be to declare something as a discovery, and it’s quite stringent. Firstly, we assume that there is no new particle and calculate the probability that the signal we measure is consistent with there not being a particle there. 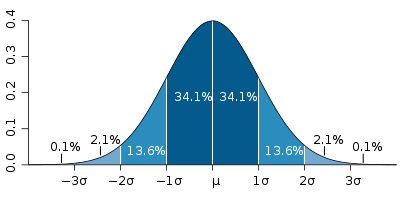 If that probability is less than 0.32 than we say we are 1 sigma certain, 0.046 = 2 sigma (this is usually good enough for most science), 0.0027 = 3 sigma… We could stop at 3 sigma, as 0.27% chance of being wrong seems awfully small, but there have been a number of possible particle discoveries at 3 sigma level that later turned out just to be statistical anomalies. So just to be absolutely sure, the usual threshold to claim a discovery is 5 sigma (0.0000003 chance of observed signal being consistent with no new particle hypothesis). Right, so we’re now pretty sure there is a new particle (that is a boson). But is it the Higgs boson? Luckily, by March 2013, evidence surfaced that the new particle is what we call ‘spinless’ (meaning it looks the same from every direction) and that its interactions match the theoretical predictions of the famed Higgs boson. Further testing will take place from 2015 onwards, as the LHC ramps up towards its maximum energy of 14 TeV for the first time (double the energy it was running at in 2011 – more on particle energies in a future blog post). The Higgs boson Part 1: What is the Higgs? The Standard Model is remarkably successful at explaining all the variety of particles we see in nature in terms of 16 fundamental particles. But there was one mystery yet remaining: why do some of those particles have mass but not others? It seemed odd that photons and gluons (the force carriers of the electromagnetic and strong forces) were completely massless, and yet the W and Z particles (the force carriers of the weak force) weighed more than an entire atom of iron! It was clear that there had to be some kind of new mechanism that could give mass to some particles and none to others. 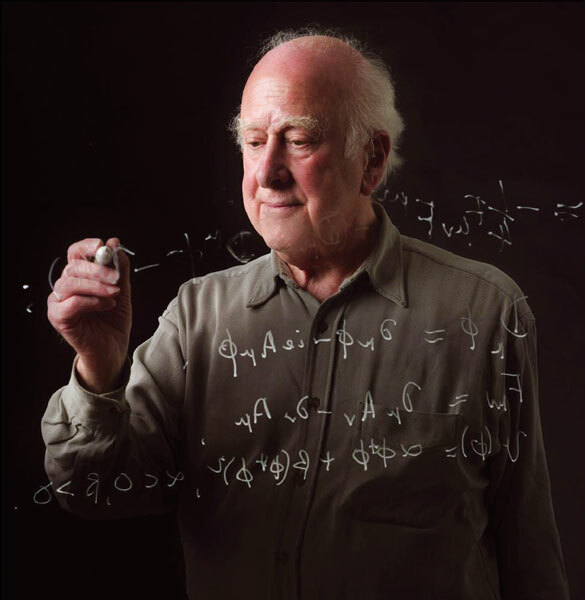 The solution came in 1964, when six physicists in three different groups (including Peter Higgs and François Englert, the 2012 noble prize winners) postulated that a field filling the entire universe, the Higgs field, is what gives fundamental particles their mass. The smoking gun signature of the existence of such a field would be a seventeenth fundamental particle: the Higgs boson. So how does it work? Imagine a field (the kind with grass and sheep) coated in snow. A skier passes by, gliding easily over the snow. Then a woman wearing snowshoes shuffles by, being slowed down by the snow. Next, a man in heavy boots struggles onwards, at each step being slowed by the snow. Finally, imagine a bird flying overhead, completely unaffected by the snow. In this analogy, the field of snow is the Higgs field and each character is a different fundamental particle. The bird is a massless particle like a photon, passing by without interacting with the field. The skier is a really light particle such as an electron, with very little mass at all. The woman in the snowshoes is a slightly heavier particle, such as a quark, and finally the man with the heavy boots is a truly massive particle like the W and Z particles, slowed by the Higgs field at every opportunity. 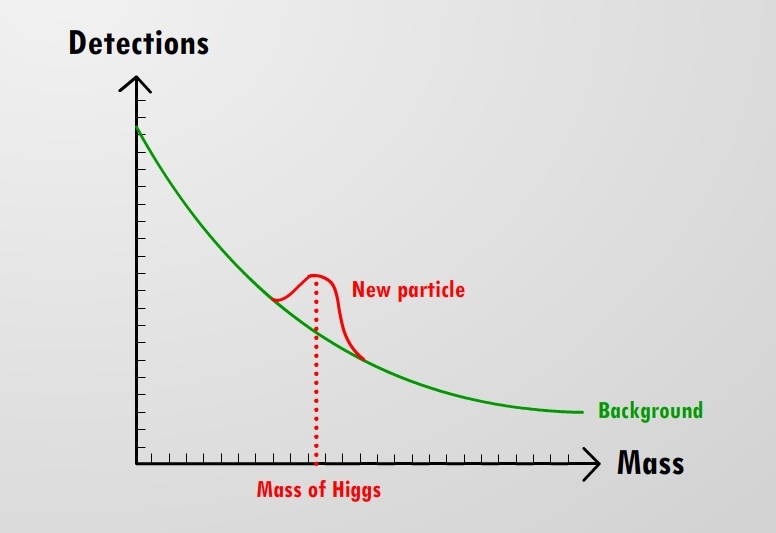 So we see that the mass of a particle depends on how strongly it interacts with the Higgs field.